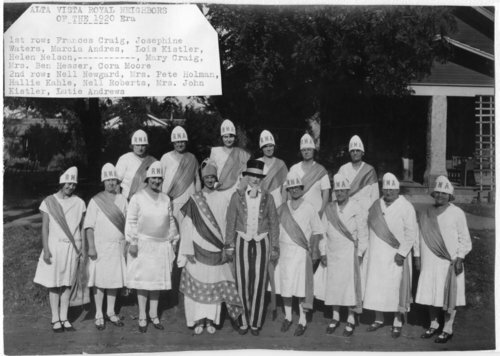 Black and white photograph showing the Alta Vista chapter of the Royal Neighbors of America in Alta Vista, Kansas. The Royal Neighbors of America, a fraternal organization for women, was originally the female auxiliary of the Modern Woodmen of America. Some of the women have been identified as Frances Craig, Josephine Waters, Marcia Andres, Lois Kistler, Helen Nelson, Mary Craig, Mrs. Ben Hesser, Cora Moore, Nell Newgard, Mrs. Pete Holman, Hallie Kahle, Nell Roberts, Mrs. John Kistler, and Lutie Andrews.